Spaces of Possibility is a working conference on contemporary Korea and Japan that seeks to closely consider new kinds of cultural and social spaces that have begun to appear in the wake of the Asian economic crisis of the late 1990s. The past two decades, following the economic growth of the late twentieth century in Japan and Korea, have been a period of dramatic social and economic change, The Asian and worldwide financial crises have affected the two countries in differing, but also related ways, accelerating and deepening trans-border interactions and cultural influences between them. 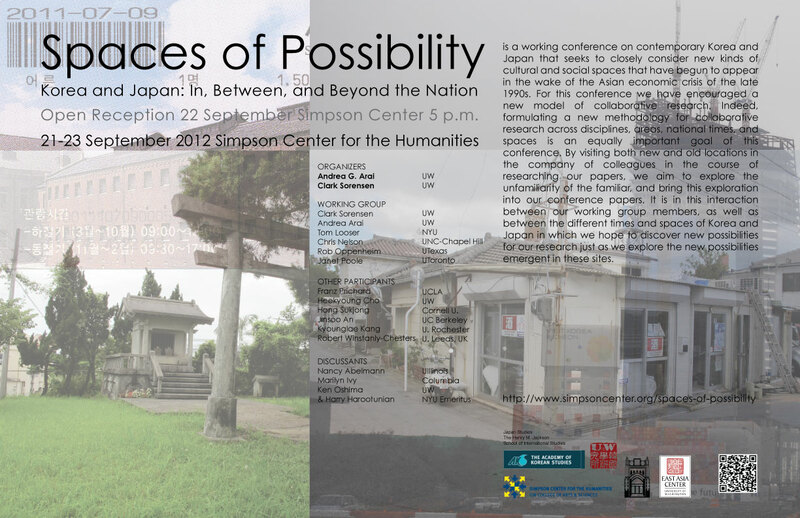 The papers included in this conference propose to engage with spaces in, between and beyond the national borders of Japan and Korea. Some of these spaces involve the ambiguous longings and aesthetic refigurings of the past in the present; the new social possibilities that emerge out of the seeming impossible spaces of development or between North and South Korea; the opportunities of genre and spaces of new ethical subjectivities. For this conference we have encouraged a new model of collaborative research. It will be the first formal opportunity for this interdisciplinary and inter-regional group to present its initial results. Indeed, formulating new methodology for collaborative research across discipline, areas, national times and spaces is a second, but equally important, goal of this conference. By visiting both new and old locations in the company of colleagues in the course of researching our papers, we aim to explore the unfamiliarity of the familiar, and bring this exploration into our conference papers. It is in this interaction between our working group members, as well as between the different times and spaces of Korea and Japan in which we hope to discover new possibilities for our research just as we explore the new possibilities emergent in these sites. Sponsored by the Jackson School for International Studies, the Simpson Center, Japan Studies, the Center for Korea Studies, East Asia Center, and the Academy of Korea Studies. Abstracts for Spaces of Possiblity are viewable online. A conference poster is also available for download. The panel and conference schedule is now available.